Looking out across the green, your eyes focus on the small flag in the distance. You step up, relaxed, you grip your golf club, place your ball on the tee and prepare to send it flying. With one sweeping motion, your golf club connects with the ball and projects it off into the distance. But frustration settles in as it doesn’t go quite as far as you would have hoped. At one point in the past, you were able to drive it clear down the green, but recently you’ve seen a distinct difference in your game. So is there a hope for getting back to your former glory? In this article we’ll explore what is potentially affecting your golf stroke and how the use of certain tools and practices can help you once again achieve the perfect golf swing. When we learn a movement, our brain records that movement in a region called the cerebellum. The cerebellum plays an important role in balance and motor control by mapping and refining our movements as we perform them. The main nerve cell involved in this mapping is called a Purkinje cell. 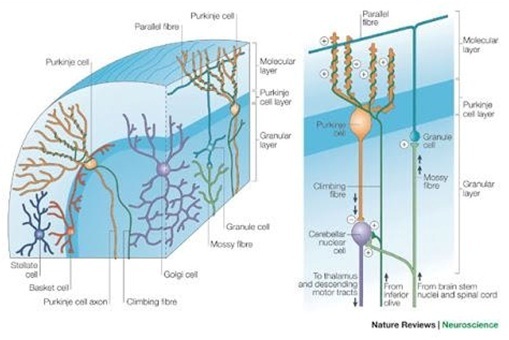 When we move, the Purkinje cell begins its growth much like a new tree grows. On repetition of a movement a tree stump begins to grow into a larger structure. Then, as the movement is refined, the Purkinje cell begins to branch as does a growing tree. With subsequent movements the tree branches become increasingly complex and are joined by two other nerve support cells (mossy and climbing fibers). Ultimately, the more complex and refined a movement is the more complex the final tree structure is. The main source of stimulation for the growth of the tree is the Proprioceptors (read ‘position sensors’) in the tissues closely associated with our joints. These proprioceptors tell the brain (and more importantly the cerebellum) what position the joints are in, how fast they are moving and at wle. When a position sensor is injured or a movement has simply been learned incorrectly, you often create an incorrect branching in your cerebellar trees. This inappropriate map is often the root cause (pardon the pun) of errors in consecutive swings which leads to poor timing, a lack of power and ultimately a bad round of golf. These changes do not appear out of the blue; Those small repetitive injuries from constant sitting in front of the computer and those falls out of a tree as a child all add up. The damage has been cumulating and the net effect is a lot of incorrect ‘movement trees’. So as we’ve seen, proper treatment of the injury to correct the issue is essential, followed by time with a tool to ensure the healing takes place in the correct manner. Golf Swing Right Now’s Timing Improver’s aim is to assist your brain in correcting the mapping process. To create the perfect swing your brain needs to connect to your joints to reproduce your swing timing consistently. Somewhere along the line it’s likely that your brain had a ‘disconnect’ from what your body was doing. Golf Swing Right Now is here to help you reconnect.